Cook pasta as directed on box. Meanwhile, in small bowl, stir together seasoning mix (from salad box), mayonnaise, 3 tablespoons of the lime juice and the water until blended. Drain pasta; rinse well with cold water. Shake to drain well. Spread drained pasta on serving platter. Drizzle mayonnaise mixture over pasta. Toss avocado with remaining 1 tablespoon lime juice. 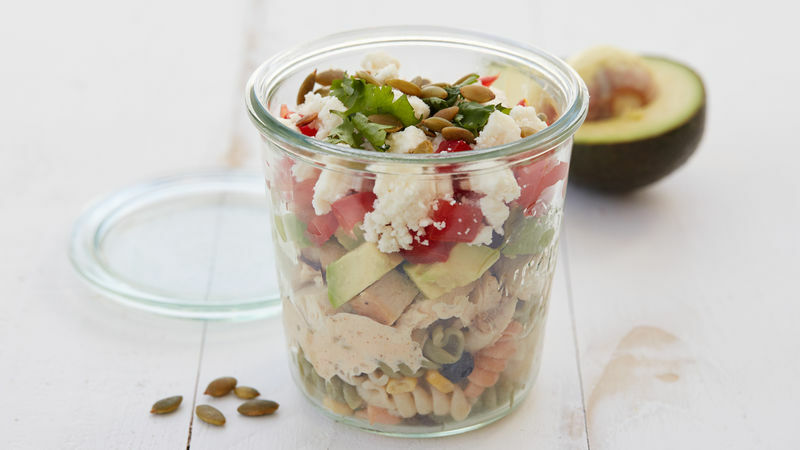 On top of pasta, arrange in rows the avocado, chicken, tomato and queso fresco cheese. Sprinkle with cilantro and pumpkin seeds. Serve immediately, or cover and refrigerate until ready to serve. Just before serving, toss to combine salad ingredients. Serve this salad with tortilla or sweet potato chips on the side. For extra heat, drizzle this salad with a little Sriracha sauce.